Bios of Muhammad Shafi, Nayrizi Vahidi, Abu Turab, Imam Jumih Shirazi, Ahmad Khoshnevis Nayrizi, Muhammad Nayrizi, Pari Jan Khanum, Shaykh Baha'i, Jalal Misaghi, Rooha Ahdieh Misaghi, Muhammad Husayn, Shafi Rouhani, Ja'fari Yazdi, Ibrahim Khoshnevis, etc. The following biographies are all mirrored with permission from nayriz.org, and were prepared in conjunction with the book Awakening: A History of the Bábi and Bahá'í Faiths in Nayriz. Mullá Muhammad Shafi of Nayriz, son of Mullá Ali Naqi, was born in 1841. Mullá Ali Naqi set out on foot with the 9-year old Shafi upon learning of the impending arrival of Vahid. They walked a distance of 40 miles to welcome Vahid. Later, Shafi's father was killed on the mountains during the Second Upheaval. His entire family participated in the Second Upheaval. Four sons and three brothers of Mullá ‘Abdu'l Husayn Nayrizi, Shafi's grandfather, were martyred. After the loss of Shafi's father and uncles, Shafi's grandfather raised Shafi and supported Shafi's mother. By the tender age of twelve, Shafi had already witnessed the arrest and banishment to Shiraz of his grandfather, his mother and hundreds of other Bábí women and older men. In his diary, Mullá Muhammad Shafi described the brutal decapitation of his 80-year-old grandfather, while the prisoners were on their way to Tihrán. The soldiers, who were ordered by officials in Tihrán to move the prisoners from the mountains near Nayriz to Tihrán, committed the most atrocious acts. As they journeyed through the villages, much to the horror of the innocent prisoners who walked on foot and the villagers who looked on, the soldiers carried on the spears the heads of the prisoners who had been decapitated. They skinned the heads, discarded the skulls and then stuffed the skins with straw and speared them. This made the heads appear even more grotesque when paraded through the streets. Before approaching the village of Abadeh, new orders were sent to bury the speared heads and to bring the remaining male prisoners to Tihrán. Shafi and his mother were released in Shiraz, where they continued to live as guests for four years in the home of the Imam Jumih. Shafi's grandfather, too old and frail to make the journey to Tihrán, was killed not far from Abadeh. Under the guidance of the Imam Jumih of Shiraz, Shafi studied religion, Arabic, logic and poetry. He traveled extensively in Iran visiting Sarvestan, Jahrum, Kerman and Rafsanjan. Imam Jumih requested Shafi to return to Nayriz where he was put in charge of the Mosque of Jumih, a very large historic mosque. This was the same mosque where Vahid gave lectures. In addition to administering the affairs of the mosque, Mullá Muhammad Shafi, administered many real estate and water rights for properties belonging to the mosque while spreading the teachings of the Báb. After his first wife, Zeinab, passed away, Mullá Muhammad Shafi married Khavar Sultan, who was the niece of his mentor, the Imam Jumih of Shiraz, and the daughter of Shaykh Muhammad Husayn Vafa. Through this marriage, Shafi substantially increased his prestige and station amongst the clergy. He was respected by the government officials and used his position to act as a defender of the Bábís. Bahá'u'lláh showered Shafi with unprecedented affection and revealed many tablets in his honor. Many of these tablets were in Bahá'u'lláh's own handwriting. In 1883, a tablet was sent to Mullá Shafi, which contained within the Tablet of Visitation for Vahid. At one point, Shafi was appointed trustee of the Huquq'u'llah. He was credited with teaching the faith to the Governor of Nayriz. Bahá'u'lláh asked Shafi to be a judge amongst the Bahá'ís, to settle disputes amongst others and to officiate over marriages. Mullá Muhammad Shafi also received many tablets from ‘Abdu'l-Bahá. When he died, ‘Abdu'l-Bahá revealed a Tablet of Visitation for him. During his illustrious ministry, Mullá Muhammad Shafi invited many prominent Bahá'í teachers and scholars to visit Nayriz including Hájí Mírzá Haidarali, Mírzá Mahmud Zargani, the author of Mahmud's Diary, Nabil Akbar and Mírzá Naim. Bahá'u'lláh granted permission to Shafi to visit Him in Baghdad. Accompanied by another Bahá'í, they walked all the way from Nayriz to Baghdad. Shafi defended the Faith against the Covenant Breakers. Among his accomplishments was the protection of the community from Mírzá Yaya, the half-brother of Bahá'u'lláh, Mírzá Muhammad Ali, the brother of ‘Abdu'l-Bahá, and Hájí Muhammad Karim Khan. So intolerant to anything that would harm the Faith, when a member of the Nayriz Bahá'í community stated at a meeting that Bahá'ís were to follow Mírzá Yahya after the ascension of Bahá'u'lláh, Shafi severely slapped the man in the face. The man left immediately, feeling so ashamed that he did not attend any Bahá'í meetings for a year. Eventually Shafi went to the man's house and brought him back to a community gathering. To Mullá Shafi's eternal credit is his success in appointing many Bahá'ís to key positions by virtue of being trusted by the Governor of Nayriz – Phat Ali Khan. Because of his friendship with Shafi, the governor, Phat Ali Khan eventually became a Bahá'í, although he tried to keep his faith as a secret, he received a tablet from ‘Abdu'l-Bahá. The enemies of the faith were alarmed at the rapid growth of the Bahá'í community and the unprecedented influence of Mullá Muhammad Shafi. In the early years, before Phat Ali Khan became sympathetic to the Bahá'ís, they encouraged the governor to attack the Bábís and Bahá'ís again. When Shafi realized that the governor might just do that, he prompted a few brave survivors of the mountain upheaval, to warn the governor that harm might come to him if he continued the harassment of the Bahá'í community. The governor was so frightened that he changed his attitude towards the Bahá'ís. He called on Mullá Muhammad Shafi to express his regret about the actions of his father and his own conduct. The governor signed a written agreement that he would not harm Bahá'ís. Shafi found him to be sincere, so Shafi also signed the document. As a consequence, the relations between Muslims and Bahá'ís in Nayriz improved tremendously thereafter. The governor even began to consult with Shafi about the community affairs. The Bahá'í community flourished under the leadership of Shafi. Their number reached a few thousand. Shafi counselled Bahá'ís against being afraid of their sacred destiny and to this day, the descendants of many of those early believers are still serving the cause throughout the world. The Nayriz Bahá'í community was blessed by receiving many tablets and letters from both Bahá'u'lláh and ‘Abdu'l-Bahá which addressed Bahá'í laws, giving instructions on how to conduct their lives and ways in which to serve the Faith and humanity. As an example of his kindness, Shafi would go to the houses of the poor early in the morning and would leave food and clothing at their doorsteps anonymously. While he was generous and kind to all, especially the poor and disadvantaged, Mullá Shafi would not hesitate to rebuke vehemently those who chose to be rude and unruly or disrespectful of the precepts of the Faith. When his mother advised him not to fight the Mullás, he responded firmly that he would not hide under a chador. The sudden death of his son ‘Abdu'l Husayn was the most traumatic event in Shafi's life. He was known to go often to the mosque where he prayed for such a long time that he would pass out and had to be carried home. On hearing about this, Bahá'u'lláh sent him a tablet consoling and comforting Mullá Shafi who was distraught over his departed son. At the request of Bahá'u'lláh, Mullá Shafi put the final touches on his diary. According to Kasravi, the famous historian, Shafi finished his book soon after his return from Baghdad and sent a copy to Bahá'u'lláh. It was a diary so precise and complete that it later became the prime source of information for many future historians including Nabil, Nicolas, Mazandarani, Avareh, Rouhani, Faizi and Shaykh Bahá'í. Mullá Shafi died in 1900 at the age of 59 due to complications from bronchitis, extreme fatigue and weakness after fasting for seven days. After Shafi's death, Aga Siyyid Doavod, the leading Mullá of Nayriz, ceremoniously placed Shafi's turban on the head of Shafi's 15-year-old son, while declaring confidently that Shaykh Muhammad Husayn would continue the legacy of his father, Mullá Muhammad Shafi. Mirzá Ahmad Nayrizi, who later chose Vahidi as his last name, is my grandfather from my mother's side. He was a descendant of the most distinguished calligrapher in the recent Persian history, Mirzá Ahmad Khoshnevis, whose calligraphy and designs of the Qur'án are known worldwide. 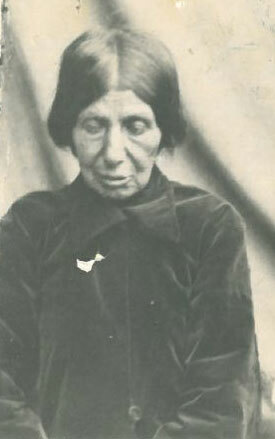 Bibi Bigum, the granddaughter of Mirzá Ahmad Khoshnevis married Mirzá Husayn Shallfurush from Nayriz. Their son was Mirzá Ahmad Vahidi. He had the good fortune to travel to Haifa, Palestine then, Israel now, for Pilgrimage during the time when ‘Abdu'l-Bahá placed the remains of the Báb to rest on Mount Carmel. The day after the internment, Mirzá Ahmad Vahidi related that ‘Abdu'l-Bahá was clearly agitated, judging from the expression on his face and the tone of his voice. ‘Abdu'l-Bahá said three times to the assembled pilgrims, “the sea is stormy while the water was very quiet” and “the tree of the Faith needs to be watered by the blood of the martyrs (in tribute) for the resting of the remains of the Báb”. ‘Abdu'l-Bahá ordered the three pilgrims from Nayriz to cut short their pilgrimage and return home immediately. Tahereh's grandfather Mirzá ‘Abdu'l Husayn, tried to secure permission from ‘Abdu'l-Bahá for his business partner, Mullá Hasan to visit the Holy Land but ‘Abdu'l-Bahá responded emphatically that Mullá Hasan has accomplished his pilgrimage. Those who heard the response were surprised, as they knew that Mullá Hasan had not been to Haifa. Later on, when they returned to Nayriz it was discovered that Mullah Hassan, along with 17 others had been martyred. It was then that they realized the wisdom of ‘Abdu'l-Bahá's statement. Mirzá Ahmad Vahidi received many tablets from Abdu'l-Bahá and some from Shoghi Effendi, but unfortunately most of them are lost. In one of the tablets, ‘Abdu'l-Bahá had referred to him as a “Mighty Brave Man”. His obedience to Bahá'í law was strong as illustrated in the following: before he became a Bahá'í, Mirzá Ahmad had two wives. However, after the Guardian's instruction that Bahá'ís cannot have more than one wife, Mirzá Ahmad immediately separated from one of them, yet continued to support her throughout the rest of her life. He was known for having a keen sense of wisdom and ability to compromise. He had more than once managed, through his good judgment to save the lives of some of the Bahá'ís of Nayriz. The story of a rebel leader, Shaykh Javad, who was bent on attacking the Bahá'ís of Nayriz, is noteworthy. Mirzá Ahmad and a handful of Bahá'ís walked a long way to meet him. Mirzá Ahmad told the rebel, “If you have come here to kill Bahá'ís, then kill me, for I am the famous one, and if you have come here to collect money and ransom, I will give you as much as you want”. Mirzá Ahmad became a Bahá'í through the efforts and patience of a shopkeeper in Nayriz, a story he told many times. Early in his life, because he was a Moslem and Moslems considered Bahá'ís to be infidels, he avoided contact with Bahá'ís, abused them, and harmed them at every opportunity. Mirza Ahmad now being quite curious asked the local mullá about this particular Hadith. The mullá insulted him and asked him to avoid the shopkeeper. The reaction of the mullá made him more anxious to pursue the matter further. My grandfather and the shopkeeper studied together, had more discussions, met some other Bahá'ís and eventually Mirzá Ahmad became a Bahá'í. He always regretted the fact that before becoming a Bahá'í, he had treated the Bahá'ís so discourteously. After his pilgrimage to Haifa at the time of ‘Abdu'l-Bahá, Mirzá Ahmad returned to Nayriz and resumed his tireless efforts to defend the Bahá'í Community. Meanwhile his business thrived and he became one of the richest landowners in town. He believed the more money one spent for the Cause, the more blessings God granted one in return. He was granted permission to visit the Guardian on two occasions. During his second pilgrimage, the Guardian asked him to pioneer to Arabia. Mirzá Ahmad moved to Arabia in 1950 and stayed there for two years until he was forced to return. He gave freely to the Faith. One of his significant contributions was the gift of all of the Persian carpets for the Shrines of the Báb and of ‘Abdu'l-Bahá, which Mirzá Ahmad had custom-woven by a famous carpet maker of Yazd, using material he hand picked. New identical carpets recently replaced the original ones that have been deposited into the Archives. Among the first of Shaykh Abu Turab's family to come to Shiraz from Saudi Arabia was Shaykh Husayn Jazaeri, along with his son, Shaykh Muhammad Zahed, also known as Siyyid Mofid. They became the leading Mullás of Shiraz known for their knowledge of the Qur'án and Islamic traditions. Two of their writings are still in use today. Shaykh Mofid died in the year 1732 and his son Shaykh ‘Abdu'l Nábí replaced him as the leading Mullá. Shaykh ‘Abdu'l Nábí was the first in the family to become Imám Jumih of Shiraz. He was known for his intuition and detachment and was well respected by the folks in the town. Shaykh ‘Abdu'l Nábí died in the year 1813. Then his son Shaykh Abu Turab, became the Imám Jumih. As the leading Mullá, all knew him for his good nature, purity of motive and extreme kindness. A supporter of the weak and defender of those who suffered injustice at the hands of government officials, in 1840 he travelled to Tihrán to complain about the Governor Farodin Mírzá to Muhammad Sháh for lapses in judgement. The king showed him a great deal of affection and respect, and sent Imám Jumih back to Shiraz in 1843 with more authority and power. Shaykh Abu Turab was known to have spared the Báb from receiving sever castigations on numerous occasions. Mullá Muhammad Shafi and his mother came to live in Shiraz during the time after the martyrdom of his father, grandfather and the rest of his family. Imám Jumih, noticing Shafi's intelligence and good nature, arranged for the marriage, which took place at a later date, of Shafi to Khavar Sultan, the Imam's niece. When the Mullás of Shiraz signed a death sentence for the Báb, which was ratified by the governor, Imám Jumih refused to sign the petition, and for this reason he was credited with having saved the life of the Báb. The three leading Mullás who had signed the petition for the Báb's execution were Shaykh Husayn Nazem-ul-Sharieh, Shaykh Mehdi Kajvari, and Shaykh Muhammad ‘Alí Mahalati. Imám Jumih not only did not sign the petition, but he severely chastised the other three Mullás for their actions. He arranged for a large gathering in the Mosque of Vakil, in which the Báb was invited to discuss His claim. The governor Husayn Khan and others thought the Báb would use the occasion to recant His claim. The full description of this gathering is in Nabil's Narrative: The Dawn Breakers. The Mullás used the occasion to rebuke the Báb, Shaykh Abu Turab asked Him to leave the mosque and to go to His family home. The governor likewise was quite abusive to the Báb. In the mosque, when Shaykh Zalim raised his cane to strike the Báb, another man shielded Him with his shoulder. The conduct of the Báb in this gathering resulted in the conversion of a number of people, including Shaykh ‘Alí Mírzá, Imám Jumih's nephew, who became a staunch defender of the Bábís. In that gathering, according to the author Muhammad ‘Alí Faizi, Imám Jumih asked the Báb to sit at the top of the marble pulpit while the Imám Jumih sat directly behind Him, as a sign of respect. The Báb's tone and the subject of His speech mesmerized the audience. The kindness and support of Imám Jumih of Shiraz continued toward the Bábís and consequently toward the Bahá'í community. After his death, the Imám Jumih's son and his grandson, who replaced him as Imám Jumih, continued to be close friends, associates and defenders of the Bábis. Imám Jumih picked up the Báb's turban and placed it back on His head apologizing for the governor's behaviour and invited the Báb to sit next to him. Then he addressed the assemblage saying that one should admire the Báb's dedication and extreme devotion to God. The governor's plan was to put the Báb in prison after the meeting. However, when he saw Imám Jumih's affection toward Him, he changed his mind, placing the Báb under house arrest, supervised by the Báb's uncle. In addition, many people who witnessed the behaviour of the Imám Jumih towards the Báb changed their attitude about Him. Mirzá Ahmad Khoshnevis, the son of Shamsaddin Muhammad Nayrizi, was born in 1682 in the Mahaleh Sadat district of the city of Nayriz. He was a celebrated calligrapher and the most notable of the 18th century in Iran for his highly developed use of the elegant and visually powerful Naskhi style of calligraphy. 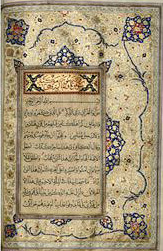 Examples of his hand written Qur'áns and other writings are kept in museums around the world. Golestan Museum in Tihrán holds most of the 90 to 120 Qur'áns attributed to him. 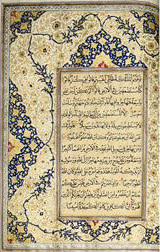 His calligraphy works are frequently seen at auction today at Christies, and other fine auctions online, fetching high prices in particular for his Qur'áns containing the use of heavily illuminated Qajar borders on every page. His style is known for having well formed letters; with vowels being weighted the same as consonants. In addition to the Qur'áns, he completed over 70 major works and many other smaller tablets. There are numerous accounts of his life and art both in Persian and English including an extensive biography of Mirzá Ahmad Nayrizi in the Encyclopaedia of Islamic Culture. Mirzá Ahmad Nayrizi received his basic education and training in the religious schools in the city of Nayriz. At the beginning of the 18th century he moved to the city of Isfahan, the capitol of Iran during the rein of Sháh Sulaymán Safavi. There he was welcomed to the court of the Sháh, receiving great acclaim and affection. He is known to have created works for the royalty for at least two decades under Sháh Sulaymán Safavi and Sháh Sultán Husayn, from whom he received the surname “al-Sultáni”. Mirzá Ahmad Nayrizi reportedly accumulated a large amount of wealth from his art. Known as a pious man and being of the nature to follow a simple life, he spent most of his wealth to help the poor. Conflicting reports place his death at Karbala, or Nayriz and still others at Isfahan, around the year 1722. A beautiful memorial centre was built and a statue erected in Nayriz in his honour, as part of the national heritage. He had several children and grand children. Among them was his grand daughter Bibi Bigum who married Mirzá Husayn Shallfurush from Nayriz. They had a son named for his great-grandfather, Mirzá Ahmad Vahidi, who is my grandfather. Ahmad Nayrizi is remembered by aficionados of Persian calligraphy as the last great practitioner of the Naskhi style. 120 Qur'áns as well as 70 other great works are attributed to him. Many of them reside in the Golestan Museum in Tihrán. He received his religious and calligraphic training in Nayriz but spent most of his working life in Isfahan, which was the capital of Persia in the 18th century. He was an extremely successful and sought-after calligrapher and is known to have created works for the royal family for at least two decades under Sháh Sulaymán Safavi and Sháh Sultán Husayn. Shortly after the death of Muhammad, Kufi emerged as the script used for copying Qur´áns and remained so for 300 years. It is known for its angular letters and lack of diacritical marks. Around the 10th century CE, new scripts began to replace Kufi. One of these was Naskh. Naskh (which means "copying") script was originally used for correspondence and literary works. 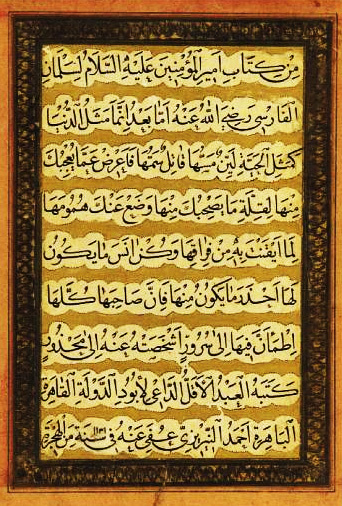 In the 10th century, the renowned calligrapher Ibn Muqla redesigned Naskh and applied a set of rules governing size and proportion to the script based on the letter alif. 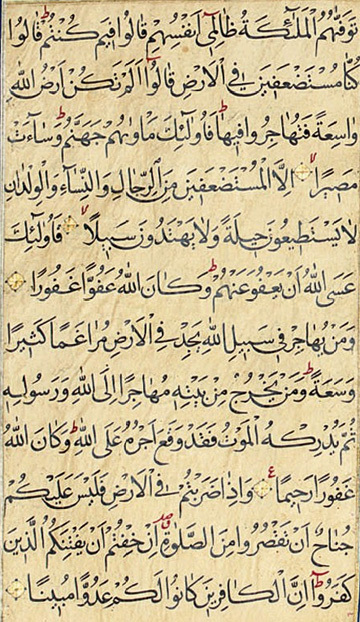 The script was further refined by Ibn Al-Bawwab and came into use for writing the Qur'án. More Qur'ans have been written in Naskhi than in any other script. From a calligraphic perspective, Naskh is characterized by short horizontal stems and with an almost equal vertical measure above and below the midline. It has full, deep curves, and its uprights are straight. Naskh is still in use today. Because of its legibility and clarity, Naskh has been adapted to fonts used in typesetting and printing. Ahmad Nayrizi is still regarded as its last great master. His style is known for having well formed letters, with vowels being weighted the same as consonants. Of course a beautiful illuminated page requires more than elegantly perfected writing. It relies on painting, bordering, and various motifs. Some elements are decorative, other are functional (such as verse indicators). We can reasonably assume that Ahmad Nayrizi collaborated with other artists and artisans to create finished pages and ultimately bound volumes. These would include painters, illuminators, and bookbinders, among others. In Islamic culture. calligraphy is not only an art form and profession, but also a vehicle of spiritual perfection. 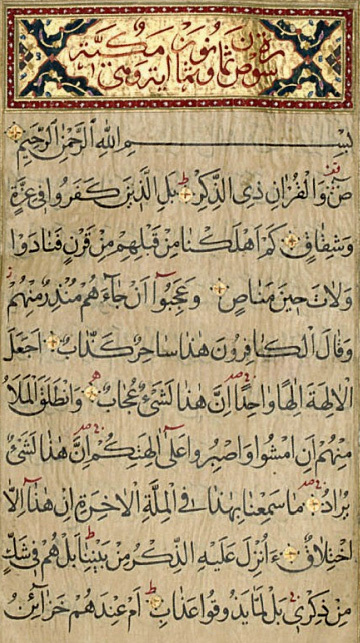 Ahmad Nayrizi was known for his skill as a calligrapher as well as for his piety and service to the poor. Ahmad Nayrizi is still remembered and venerated today. 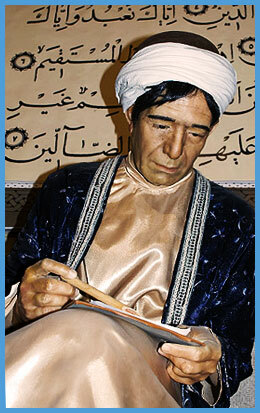 At a wax museum in Shiraz, his likeness is on display. He is depicted in the act of writing with a larger-then-life sample of his work above and behind him. In addition, facsimiles of his calligraphy and designs can be found in Qur'áns being published today. According to the distinguished historian Fazel Mazandarani, in his book Zuhurul Haq, Mullá Muhammad Nayrizi is characterized by his unquestionable loyalty to Vahid during the first upheaval of Nayriz. He was known for his desire and perseverance to seek revenge against those he considered as enemies of the Bábís. He left his wife, two small children and 12-year-old blind brother to join Vahid in the Khájih Fortress during the first upheaval. His family was very much against this move. His wife and the children went to the wall of the Khajih Fortress crying and begging him to show pity on them and to return home. He resolutely refused their request. He told them that he had begun a journey of love and would not stop until he had met his Beloved. Not long afterwards, while riding outside the fort at night he was shot in the face, then captured and sent to prison. With the help of a childhood friend, he escaped from prison and went to the city of Estahbanat where he stayed for six months to recover from his wounds. While in Estahbanat, the governor of Nayriz arrested his parents and his twelve-year-old blind brother, Asghar. The government agents cruelly tortured the little boy daily with a hot iron in front of his mother. The governor demanded his family transfer titles to their land and homes to the governor. They had no choice. Tragically, Asghar died as the result of so much torture. Mullá Muhammad returned to Nayriz after the death of his brother. Enraged by the tales of torture and atrocities directed at his family, he vowed to revenge the injustice. He blamed the Sháh of Iran for all the atrocities directed at Bábís across the county and left Nayriz for Tihrán with the intention of killing the Sháh. A few other Bábís including Muhammad Sadeq Tabrizi joined him. The group assassination attempt in August of 1852 failed and the angry Sháh ordered the would-be assassins to be arrested. They were tortured and put to death. Mullá Muhammad Nayrizi had two sons: Muhammad Karim and Hájí Muhammad Rahim, whose daughter Laqa Khanum was Adib Taherzadeh's mother and a relative of the Misaghi families. Laqa Khanum married Hájí Muhammad Taher Malmiri, the famous historian. She was the granddaughter of Siyyid Ja'far-i-Yazdi, companion of Vahid in the Khájih Fortress in Nayriz. One would be hard pressed to find any other person who has suffered more for her religious beliefs than Pari Jan Khanum who was known as the “Angel of Nayriz”. 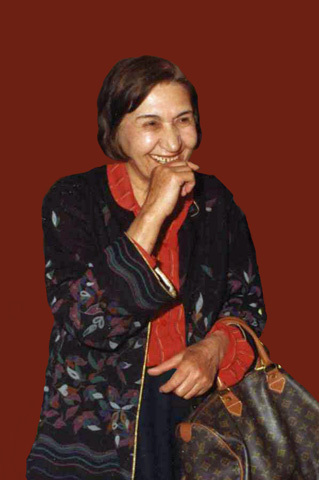 She was a distinguished and celebrated woman in the Bahá'í Communities across Iran. Her life story and sacrifices were well known among the Bahá'ís during her lifetime. Pari Jan Khanum and her husband Mullá Hassan had two children: Fatimih and Mullá Ali Baba. In a tablet, ‘Abdu'l-Bahá referred to her son as “‘Abdu'l -Samie”, which was also the name of his grandfather. During the third upheaval in Nayriz, incited by Shaykh Zakaria, the young Pari Jan witnessed the mass slaughter of 18 innocent Bahá'ís, including her husband and her father, which she writes about in her autobiography. As if this were not enough, in addition, their harvests were destroyed and their properties were confiscated. Soon after the third upheaval, Pari Jan visited ‘Abdu'l-Bahá, Shoghi Effendi and the Greatest Holy Leaf. During her stays in Haifa, she was the recipient of their love and admiration. She received numerous tablets from ‘Abdu'l-Bahá' and from Shoghi Effendi, the Guardian of the Bahá'í Faith. Throughout her life, Pari Jan Khanum welcomed friends to her home, showering them with a great deal of love and affection. She would often reminisce in her soft voice about the suffering Bahá'ís endured during the third upheaval. I spent a lot of time with her when I was visiting Nayriz and enjoyed every moment of it. She gave me the book, Faraed by Mírzá ‘Abu'l-Fazel Gulpayegani, the eminent Bahá'í scholar. I read the book several times, asking her many questions. Her grandchildren are my cousins. Six years of happy marriage and good life was suddenly ended by the arrival of a brutal assailant named Shaykh Zakaria. His arrival and the ensuing massacre of 18 Bahá'ís coincided with the internment of the remains of the Báb in Mount Carmel by ‘Abdu'l-Bahá in 1909. Our days and nights were spent in fear. Five days before Naw-Ruz we left our house and moved next to the Mosque of Jumih – the stronghold of the Bahá'ís and a defensive building of our district. Shortly after Shaykh Zakaria's army ransacked our homes and our district they began to attack the mosque. They destroyed the defence lines of the Bahá'ís. Soon my mother joined me. There were a few friendly women in the crowd, who recognized us saying, “Are you out of your mind to be here? They are looking for you to kill you!” We had no choice but to run back to our district. We tried to hide in a neighbour's house, but they did not let us in. We tried a few other homes, but nobody would give us shelter. We had no choice, but to flee outside the town and hide in the field amongst the tall bushes. The owner of the field also kicked us out. Then we came across a wall, the two of us climbed over the wall. It was a large orchard and we hid in it. Nighttime fell and we were hungry and scared, it was dark and we were trembling. We could hear the mob screaming while they were hanging my father. Suddenly a friendly man, who was searching for us also climbed over the wall. He told us that he would help us. He gave us shelter that night and for fourteen days we were hiding in his house. Occasionally we would have some food to eat. When my husband was killed, he was only thirty-three years old. He was a good man, a pure man, and a well-loved man by everyone. They tried so hard to make him recant, but he refused. He told them “I have lived thirty three years in this earthly life, if I recant I may live another thirty years. Do you think that I would deny my Lord for a few years of earthly living? Do you think that I would give up an eternal life for this few fleeting moments?” Three days after my father's death, a friend of his brought the lifeless body down from the tree and buried him next to a river. The way they killed my father was horrible. After they tortured him severely, they cut his body and then they hung him upside down in a tree next to the Mosque of Jumih. A fire was built and his body was burned. For three days his burnt body was left hanging on a tree. They buried the body in a secret spot. Regarding the significance of the massacre of Bahá'ís during the third upheaval, in a tablet addressed to the Bahá'ís of Nayriz, ‘Abdu'l-Bahá stated that the transfer and internment of the body of the Báb in Mount Carmel required a sacrifice: it was the eighteen Bahá'ís of Nayriz who made the sacrifice. Pari Jan ascended to the Abha Kingdom at the age of 87. Shaykh Bahá'í was born in Nayriz while his father, Shaykh Muhammad Husayn, was away on pilgrimage to Haifa while influenza became a major epidemic in Iran. His prominent roots run very deep as the humble son of a distinguished father from the city of Nayríz. There he learned to emulate his father by developing a broad knowledge and devotion to the Faith. This exemplary man was forced after his father's death to accept the responsibility of caring for his younger siblings. He was always grateful that Bahá'u'lláh had provided him with a purpose for his life that allowed him to grow socially and spiritually. He married Bushra, the youngest daughter of a well-to-do man, Hájí Mirzá Ahmad Nayrizi Vahidi (a descendent of the famous calligrapher of the same name). She was a wonderful mother and wife and a devoted Bahá'í. They had five children together. He chose to live a modest lifestyle emphasizing education. He worked relentlessly to educate himself and his children. He had a keen sense of humor, was well versed in the Qur'án and the traditions of Islam. He was a remarkable debater and orator. Honest and hospitable, he was a great Bahá'í teacher. 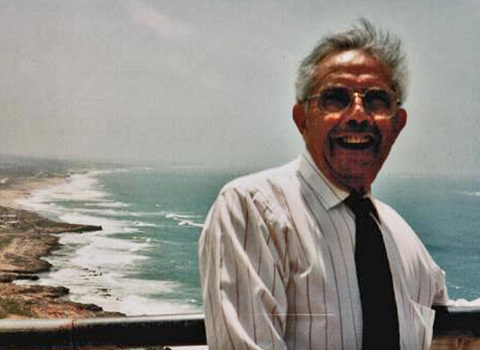 He served many years as a member of the Local Spiritual Assemblies of the Bahá'ís of Nayriz and of Abadan and often served as their secretary. For many years he was selected as a delegate to the National Convention. Shaykh Bahá'í studied with some of the leading Bahá'í teachers including Mr. Samandari and Mr. Faizi, who often visited Nayriz for an extended stay as his guest. He committed to memory hundreds of tablets and prayers. He was fond of poetry, which he often recited with a melodious voice while giving his lectures. 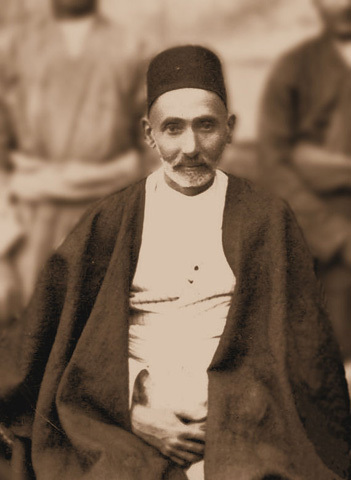 Shaykh Bahá'í had a special dislike for Mullá Mohayadin Falli, a mullá who attracted a large number of Nayrizi's and used them to harass the Bahá'ís and to control the affairs of the town. Realizing that killing Bahá'ís would attract bad publicity and intervention of the federal authorities, Mullá Mohayadin Falli chose instead to simply torment the Bahá'ís continuously. This evil man barred Bahá'ís from using the public baths, discouraged doctors from treating them and merchants from selling them food. Mullá Mohayadin Falli callously prevented Bahá'í children from attending schools. Bahá'í marriages were not recognized, causing the children to be considered illegitimate. He destroyed the Bahá'í cemetery and would not allow the burial of Bahá'ís in the public cemetery. Other atrocities committed by Mullá Mohayadin Falli included the destruction of their harvests, killing of their livestock and subjecting them to such unbearable conditions that they were forced to leave town. He even persuaded one Muslim woman to kill her Bahá'í husband with the help of her brother. 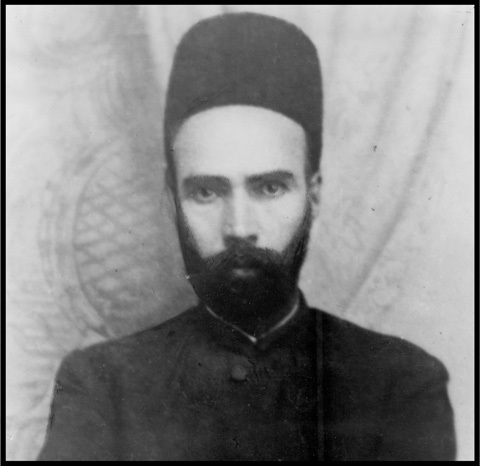 At the instigation of Mullá Mohayadin Falli, scores of Bahá'ís, including Shaykh Bahá'í, were physically attacked and severely wounded. In the late 1940's, when the country was going through a major political crises and upheaval, Mohammad Tahmai, a rebel and a follower of Mullá Mohayadin Falli, along with four of his body guards living in the mountains near Nayriz, frequently harassed and injured members of the Bahá'í community on the way to and from their farms. On one occasion, Shaykh Bahá'í had arranged a debate between Mullá Mohayadin Falli and Mr. Tarazollah Samandari. The governor who was friendly to Bahá'ís knew that Mullá Mohayadin Falli was up to no good and might create even more troubles for the Bahá'ís, so the governor canceled the debate. The angry Mullá Mohayadin Falli blamed Shaykh Bahá'í for the cancellation and ordered Siyyid Mohammad Tahmai to punish Shaykh Bahá'í for embarrassing him by organizing a debate that never took place. Soon afterwards when Shaykh Bahá'í visited his own farm, he was kidnapped, taken to the nearby mountains and tortured by Siyyid Mohammad Tahmai, who blamed Shaykh Bahá'í for instigating the turmoil in Nayriz by his correspondence with the Bahá'ís of Shiraz and Tihrán, since he was the secretary of the Nayriz Local Spiritual Assembly. Two weeks later Siyyid Mohammad Tahmai was shot by a criminal sharpshooter after the army had released the sharpshooter from prison under the condition that he would kill the Siyyid. The sharpshooter brought the dead body to town and hung it from a tree next to the house of the main troublemaker Mullá Mohayadin Falli. Soon after that Mullá Mohayadin Falli was exiled to another town. However, when he later returned to Nayriz, he still continued to harass the Bahá'ís. Mullá Mohayadin Falli built a mosque next to Shaykh Bahá'ís house from where he continued attacking Bahá'ís in general and Shaykh Bahá'í in particular. This period was the most torturous time in the life of my beloved father, Shaykh Bahá'í. Eventually, when the harassment became unbearable, he left Nayriz for Abadan. One of the highlights of his life in Abadan was a trip from there to Baghdad to visit the house of Bahá'u'lláh. Through all these sufferings, my father's continued to server the Cause and to protect his family. He died in 1978 in the city of New York shortly after completing his book on the history of Nayriz. Shaykh Bahá'í was a recipient of a tablet by Shoghi Effendi, the Guardian of the Bahá'í Faith, which he received upon the passing of his father, Shaykh Muhammad Husayn. The fourth child of Mírzá ‘Abdu’l Husayn, was Mírzá Jalal Misaghi, born in Nayriz. ‘Abdu’l Husayn died when Jalal Misaghi was still a toddler. He and his brothers: Mírzá Muhammad Shafi, Mírzá Khalil, Mírzá Ismá’íl, Mírzá Ali Akbar and Hubor, his sister were blessed with being descendants from two distinguished family lines that were noted for service to the Báb and Bahá’u’lláh. On his mother’s side, they were related to Mullá ‘Abdu’l Husayn, the elderly man who greeted Vahid on his arrival to the Nayriz area. On his father’s side he was related to Siyyid Ja’far-i-Yazdi, the companion of Vahid. Siyyid Ja’far-i-Yazdí was the grandfather of the former member of Universal House of Justice, and author of several books on Bahá’u’lláh, Adib Taherzadeh. After completing the sixth grade education in Shiraz, Jalal Misaghi returned to Nayriz and began working for his uncle, Shaykh Muhammad Husayn in the pharmacy, where he assisted in the care of patients using herbs and medications. He endured trials and suffered tremendously during agitation against the Bahá’ís by Siyyid Aziz, Shaykh Muhammad Yazdi and Shaykh Javad Khohestani in Nayriz. He was instrumental in helping the Bahá’ís of Nayriz open a school to replace their traditional Muslim education. The curriculum included studying the Qur’án, the work of traditional Persian poets, Hafez and Saadi and reading, writing and arithmetic. The Local Spiritual Assembly of Nayriz organized the school and appointed a group of teachers including Jalal Misaghi, who by then had received his certificate, which was quite an advanced degree to have in those days. Unfortunately, under the rule of Reza Sháh Palavi, all the Bahá’í schools in Iran were eventually closed. He married Rooha, the daughter of Shaykh Muhammad Husayn and joined the educational department as a teacher in the city of Fasa. Misaghi was in Fasa, during an exciting period for the Bahá’í community who had built a Bahá’í Center where they had many meetings. Unfortunately the enemies of the faith began to attack them, destroying the door of the Bahá’í Center. At night ruffians would throw stones at the homes of Bahá’ís who were also denied the right to buy food or to gather water. At one point, they stoned and injured his four-year-old son while in the courtyard of his home. The local police tried to help, but to no avail. Then the rumour came that a Siyyid from Shiraz was coming to attack all the Bahá’ís in town. Misaghi, accompanied by his family, was forced to escape from Fasa. In the middle of the cold winter night, the whole family moved to Shiraz. In Shiraz they lived in the Bahá’í Center. At that time Mr.Samandari and the historian Muhammad Ali Faizi were also there. They were all treated well. It was also during this time, that a company in the cotton business hired Misaghi. He worked for them for many years. The principle owner, a wonderful man by the name of Khazrai, sold his shares to others. The new owners were not very friendly to the Bahá’ís. One of them was a covenant breaker. After thirty years of service to the company, with no pension, nor insurance, Misaghi came to the conclusion that he would leave the company all together. He started his own business. He was much more successful working for himself. In 1948, when instructions came from the guardian of the faith - Shoghi Effendi, and the National Spiritual Assembly of Iran to the Bahá’ís of Nayriz and their local assembly that they should try to move the eighteen bodies of the martyrs of Shaykh Zakeria’s incident (the third upheaval) to a better setting. With the help of Hájí Mírzá Ahmad Nayrizi - my grandfather, Jalal Misaghi and another man, worked out a plan to complete this mission. Under the cloak of night they opened the graves and one by one they moved the bodies, collected whatever was left of the remains of those eighteen martyrs, put them in individual bags, and moved them the next day or the day after to a wonderful place by the Khájih Fortress. The new burial place was also near a place called the “Anthole”, where over four hundred Babi’s were killed while leaving the fortress during Vahid’s time. The cemetery is called Golestan Javid, or the Eternal Garden. He remembered that in the pieces of clothing buried with the bodies one could find little seeds that were still in their pockets; remnants of what they were eating when they were killed. During the ten years crusade, Misaghi decided to go home front pioneering to Qasroldasht, which was six kilometres away from downtown Shiraz. They were accompanied by a couple of other families, including eleven youths, most of whom were medical students at Pahlavi University. Most of these youth later on became great servants of the faith. Although living conditions were tough and the commuting was very difficult, they had wonderful times in their gatherings with music and frequent visits by Bahá’í teachers. He attended the opening of the Bahá’í temple in New Delhi, India and fell in love with the people, their teaching activities and their music. He and his wife Rooha decided to move to the Pune area as Bahá’í Pioneers. They stayed at the New Era Academy Bahá’í School, which had more than a thousand students. Counsellor Afshin was instrumental in inviting them and establishing their situation. Misaghi loved to garden. All the gardening of the school was his job and his wife was in charge of the kitchen. Later on, they stayed in the school dormitory and began to do extensive local travel teaching accompanied by two wonderful Bahá’ís: Azadi and Sanaei. Their time in India was the highlight of his life as they were able to travel and teach the faith. Later they moved to Iran, where they live now. 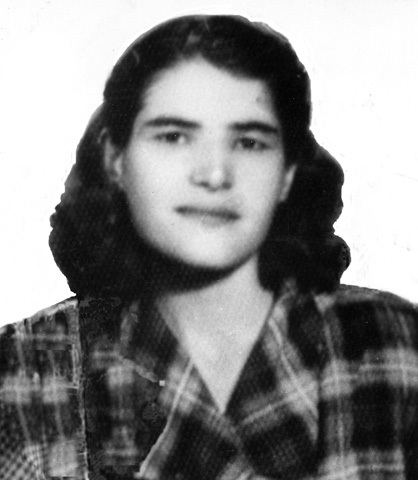 Rooha Ahdieh Misaghi (1920–2010) offered a rich legacy of service to the Cause in her home country of Iran, in the United States and in India. She raised a family whose members are still actively serving the Cause throughout the world. Rooha and her husband moved to the United States in 1975. They served for many years on the Local Spiritual Assembly of Radnor, Pennsylvania and taught the Faith effectively and enthusiastically throughout their life together. In 1986, they traveled to India for the dedication of the Bahá'í House of Worship. They were so taken by the receptivity of the people they met in India, that they decided to stay there as pioneers for many years before returning to the United States. In India, Rooha volunteered to assist the New Era Development Institute, a Bahá'í-inspired Center of Learning, serving as a volunteer at the House of Worship and participating in many teaching projects and deepening presentations. As a teenager, Rooha endured great hardship of traveling alone to the far away city of Yazd to pursue her education that was not possible in her hometown of Nayriz. On her return from Yazd she became a teacher of adult classes although she was only a teenager. Rooha Ahdieh Misaghi came from a distinguished lineage. Her father, Shaykh Mohammad Hussein, was a recognized scholar, great orator, and respected pharmacist in the city of Nayriz. Her mother was the gentle Sahib Jon, whose own mother was the niece of the famous Sardar, celebrated Babi leader during the second upheaval (1853). Shaykh Mohammad Hussein and Sahib Jon offered their home for Bahá'í meetings and entertained many distinguished guests: teachers, historians and scholars. 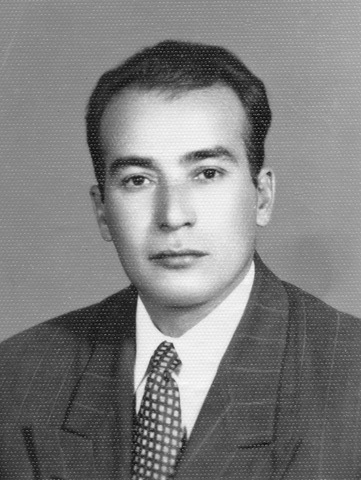 Shaykh Mohammad Hussein was instructed by ‘Abdu'l-Bahá to establish the first Local Spiritual Assembly of Nayriz, which he promptly did and served as its secretary for many years. He visited ‘Abdu’l-Bahá and was honored with a number of tablets from the Master. 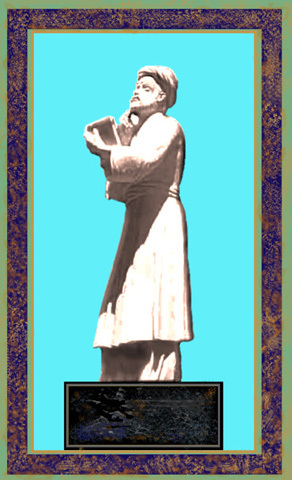 Rooha's grandfather, Mulla Mohammad Shafí, was the most distinguished personality in Nayriz during his time. Bahá'u'lláh showered him with great affection, revealed many tablets in his honor, and appointed him as a Trustee of the Húqúqu'llah and as an arbitrator among the Bahá’ís of Nayriz. Mulla Mohammad Shafí was also honored with several tablets from ‘Abdu'l-Bahá, including a Tablet of Visitation after his death. He was deeply trusted by government officials and was credited with teaching the Faith to the governor of Nayriz. Because of his unprecedented credibility, he was also able to defend the Bahá'ís on many occasions. However, his greatest contribution was his diary, which recounts much early Babi history in eyewitness style and has become a primary source of information for historians, including Nabil, Nicolas, Mazandarani, Rouhani, Feiziand, and Shaykh Bahá'í, Rooha's brother. Shaykh Muhammad Husayn, my grandfather, born in 1880, was the first son of Mullá Muhammad Shafi from his second wife, Khavar Sultan. She was related to the Imam Jumih of Shiraz. For two years he stayed in the house of the Imam Jumih of Shiraz. After his father died, Shaykh Muhammad Husayn studied Arabic, religion, logic and philosophy. Later on, some of his former classmates became the leading Mullás of Shiraz and were often very helpful to the Bahá'í's in Shíráz and other parts of the country. Renowned for his unique public speaking ability, Bahá'í scholars frequently admired his vast knowledge of the early history of the faith. His home, like the home of his father Mullá Muhammad Shafi, was open to everyone. It was a frequent meeting place for all occasions and traveling Bahá'í scholars such as, Mr.Samandari. In his younger days, Shaykh Muhammad Husayn became good friends with two dervishes who were studying alchemy in an attempt to convert copper to gold. They travelled extensively to Karbala and Khorasan, Bushehr and many other places. Some say he was really doing all this travelling just to avoid a particular woman to whom he was engaged to marry. It was common in those days for marriages to be pre-arranged, even among the Bahá'ís. Shaykh Muhammad Husayn had a great sense of humour and everybody loved him. Since he did not want to become a professional Mullá nor a religious leader, he decided to become a pharmacist. As a pharmacist, he used herbs and exotic plants to treat patients. Therefore, people often compared him to another figure in Persian history, the philosopher and poet Shaykh Atar, also a pharmacist, who had lived seven hundred years earlier. Accompanied by his very close friends, Mírzá Ahmad Nayrizi, my other grandfather, and other Bahá'ís, he travelled to Haifa for pilgrimage and to visit ‘Abdu'l-Bahá. The Pilgrimage affected him tremendously, increasing his enthusiasm to teach and to participate in Bahá'í activities. The citizens of the town, as well as the constantly changing governors, feared and respected Shaykh Muhammad Husayn. This was due to his positive influence on the ullamá, his former classmates and his family ties to the Imam Jumih of Shíráz. Shaykh Muhammad Husayn, served as secretary of the Nayriz Local Spiritual Assembly which he helped to establish during ‘Abdu'l-Bahá's lifetime. He received many tablets from ‘Abdu'l-Bahá. He married a wonderful woman, Saheb Jan, daughter of Mírzá Aqa Nayrizi. They had seven children. Saheb Jan's mother was a niece of the famous Sardar, leader of the second Nayriz upheaval, which took place in the surrounding mountains. Despite all the problems and difficulties, Saheb Jan's primary mission in life was to raise her children as good Bahá'ís and to guard the precious tablets her family had received from Bahá'u'lláh and ‘Abdu'l-Bahá. Thanks to her diligence and sacrifice we still have some of tablets in our family today, although the originals have been sent to Haifa. Shaykh Muhammad Husayn was responsible for the welfare of a large number of his relatives as well as others. In 1909, when Shaykh Zakeria attacked the town, Shaykh Muhammad Husayn collected all of them and protected them by hiding them in the southern mountains of Nayriz. The women and children could not climb the steep mountains, so he would hide them in a cave for several days at a time. When news came that Shaykh Zakeria issued an order to kill all the males older than 10 years of age, sparing the women and children, Shaykh Muhammad Husayn left the care of his family members to his close non-Bahá'í friend and relative and went to Sarvestan with two others. He made arrangements for his relative to provide protection and insure that nothing would happen to the women and children who were so vulnerable to abuse and suffering. Shaykh Zakeria was very angry when he heard that Shaykh Muhammad Husayn had left town and ordered the destruction of his house and properties. His house and shop were set ablaze. After Shaykh Zakeria left Nayriz, Muhammad Husayn returned to Nayriz. He began to rebuild with his good friend and business partner, Khajihe Aly Izadi, a wonderful Bahá'í. Like his father before him, Shaykh Muhammad Husayn wrote a history of various events in Nayriz. Currently not to be found, there is hope that his manuscript will surface one day in the near future. He is quoted in Mr. Faizi's book, History of Nayriz. The suffering and services of Shaykh Muhammad Husayn continued on for many years. A number of other incidents happened in Nayriz in which he was able to protect the Bahá'í community. For example, there was the arrival of ‘Abu'l Hasan Kohestani, brother of Shaykh Zakeria, and there was the occasion of ‘Abdu'l Husayn Khan Baharlu. Shaykh Muhammad Husayn helped the community in Nayriz when there was major flooding causing destruction in town. He became involved in protecting the Bahá'ís from Siyyid Aziz, also Shaykh Muhammad Yazdi. These are just a few of the incidents in which Shaykh Muhammad Husayn suffered a great deal. May God bless his soul. He died in 1942 at the age of 60 and was survived by his two sons and five daughters. The two boys were Bahá'í and Shaykh Agha. The girls were Roha, Afifeh, Eshraghieh, Badieh and Mahin. Mullá ‘Abdu'l Husayn, a legendary ancestor of mine, was well known as a scholar in the province of Fars. He was admired for his keen intuition, eloquent speeches, and fluid writing. It is said that tears were often flowing from his eyes while he was praying. As soon as he learned that eminent individuals such as Quduss, Mullá Husayn and Vahid had accepted the claim of the Báb, he knew instinctively that the Báb was the True One. He accepted Him in his heart and prayed to be able to render some service to Him. Mulla ‘Abdu'l Husayn and his family supported Vahid in his efforts during the first Nayriz upheaval at the fortress. Eighty-year-old Mullá ‘Abdu'l Husayn and his son, with more than 100 others, traveled for 40 miles to Ronize from Nayriz to meet Vahid without any fear of reprisal from the angry governor. Shortly after meeting Vahid, he became one of the leaders of the Bábí movement in Nayriz, commanding unprecedented respect from Vahid. When Vahid received the news that Mullá ‘Abdu'l Husayn had been shot in the leg by one of the governor's soldiers, Vahid visited him. Later in a letter, he referred to Husayn as “the First Martyr of Nayriz” even though he survived that assault. Mullá ‘Abdu'l Husayn was martyred during a subsequent episode. To protect his followers from further assault, Vahid then moved the followers to the Khajih Fortress. Mullá ‘Abdu'l Husayn and his family were among those who accompanied Vahid inside the fortress. The famous author A. L. M. Nicolas, described some of the events of that period. He wrote that Mullá ‘Abdu'l Husayn was an expert in Islamic Law and the judge of the town. Nicolas also mentioned that Mulla Muhammad Taqi, Husayn's son, had returned from Herat, where he went to meet Siyyid Ja'far, and had joined the believers in battle. Mullá Muhammad Taqi was killed at the Khajih Fort. Vahid had tried to comfort Husayn, who answered that his only wish had been to sacrifice himself and his children in the path of the Loved One. He also said that the death of his son and the rest of the family was truly a gift to the Promised One and the highest station that one could ever attain. After the Khajih Fort incident, Mullá ‘Abdu'l Husayn escaped, along with his four sons, three brothers and their families. The governor confiscated their homes and belongings. All of his sons and brothers were killed in the Second Nayriz upheaval while Husayn, with the rest of his family; mostly the women and children were captured and taken to Shiraz in chains. According to Nicolas, Husayn was wounded at that meeting when one of the soldiers took a shot at him. Mullá ‘Abdu'l Husayn's grandson, Mullá Muhammad Shafi, the son of Mullá Ali Naqi, although only twelve during the first incident at the fort, kept a precise diary covering the lives of many individuals, including Mullá ‘Abdu'l Husayn. Shafi's diary has been referenced by Nabil in The Dawn Breakers. After the interrogation in Shiraz, Mullá ‘Abdu'l Husayn was martyred as he and a score of other Bábís were being taken on foot from Shiraz to Tihrán by the order of the Sháh. In the village of Seadat-u-Abad, close to the city of Abadeh, he became very ill and could not continue the journey. Consequently, the soldiers decapitated him, buried his body, and then carried his head aloft a spear as they did with those of the other beheaded martyrs. Eventually they buried the decomposing heads, in a known location, after reaching Abadeh. 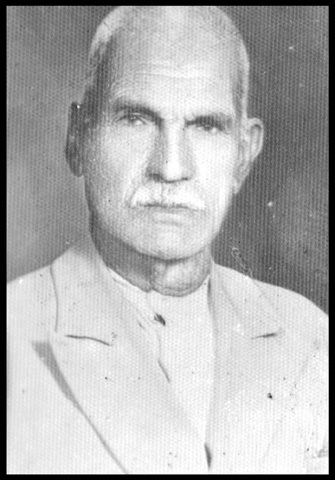 Mírzá Muhammad Shafi Rouhani was born in 1894 in the city of Nayriz. A distinguished historian and a sincere servant of Bahá'u'lláh, he came from two dedicated Bábí families. On his mother's side, he was the descendant of Mullá ‘Abdu'l Husayn, one of the very first believers of Nayriz who invited Vahid to Nayriz. On his father's side, he was the descendant of Siyyid Jafar-i-Yazdi who received a major tablet from Bahá'u'lláh. Siyyid Ja'far-i-Yazdi was a follower of the Báb and supported Vahid during the first upheaval. Mírzá Muhammad Shafi Rouhani wrote the book Lamatel-u-Anvar, a classic history of Nayriz, containing complete accounts of the lives of different families and many tablets from Bahá'u'lláh and ‘Abdu'l-Bahá. In his own diary, Mírzá Muhammad Shafi states that from the time he was an adolescent he collected many stories by interviewing people who remembered the early days of the Bábí and Bahá'í Faith. Those stories were the basis for this book. A youth during the 1909 Shaykh Zakeria assault on Nayriz, he miraculously survived the onslaught. In 1921 he went to Haifa as a pilgrim, staying for 39 days and returned with many fond memories that he shared with the friends. Mírzá Muhammad Shafi married my aunt Tuba, a daughter of Mírzá Ahmad Nayrizi Vahidi. Mírzá Muhammad Shafi and his wife raised seven children who are all in the forefront of service to the Faith. His utmost joy was teaching the Faith. In 1937 he was forced to leave Nayriz for Shiraz as the conditions became extremely dangerous for him and his family. After the 1979 Iranian revolution, the 85-year old Mírzá Muhammad Shafi and his wife lost all of their belongings. They had no choice but to leave Iran and left for India. Mírzá Muhammad Shafi died five years later in Pune, India. Most of his children have pioneered to Africa or the Middle East. Siyyid Ja'far-i-Yazdi became a Bábí when Vahid came to Nayriz. They knew each other previously. He became one of the most trusted followers of Báb and a friend and companion of Vahid. He was subject to worse treatment at the end of the First Upheaval, not only due to his views and belief, but also because the governor Khan wanted his wealth and land. During the fortress war, Vahid gave Siyyid Ja'far the responsibility of staying in Nayriz, while Vahid moved to the fortress to continue lecturing the believers and encourageing them to be steadfast in their acceptance of the Báb in the Mosque of Jumih. The governor himself was one of his admirerors. His beautiful house was close to the governor's mansion. He was a great mullá and speaker. The governor would often say that it was Mullá Muhammad Taqiy's money, and the lectures, the words of Siyyid Ja'far that caused the defeat of his army. The Governor's mother in particular loved and respected Siyyid Ja'far. She would often invite him to their house. His acceptance of the Báb's call, his support of Vahid and becoming a close adviser to him, led many other Nayrizis to follow his lead and accept the Báb. This naturally angered and inflamed the govenor further. He declared that Siyyid Ja'far be punished as a lesson for others. Siyyid Ja'far, along with Hájí Muhammad Taqiy and a few others after the First Upheaval, were arrested and put in a dark dungeon in chains. Every day they were subject to a new method of torture and punishment. Witnesses had mentioned that there were many days when they had seen Siyyid Ja'far with blood flowing from his nose and toes. To insult his station as a Siyyid they removed his green turban and burnt it. There was a major food shortage in Nayriz during this period. Food was rationed among the poor people of Nayríz. The governor's agent would often bring Siyyid Ja'far to the front of the place where the grain was stored - where people would line up to collect their rations. In order to receive a ration of corn, rice, or wheat, first the recipients would have to spit on Siyyid Ja'far's face. On one occasion a poor family was standing to the side, ashamed to spit on him. He kindly told them to do what the others were doing: spit on his face, collect their rations and feed their family. For nine mounths the inprisonment and punishment continued. Some days he was taken out of the prison and paraded around town until they reached the front of a house of a wealthy family of Nayriz. Then the guards would begin to whip him severely waiting for a member of the household to come out and give the guards a few coins. Then they would move on to the next house. Often his family and children were forced to come along and witness this savage treatment. The punishment and the beating were sometimes so severe, that the govenor's attendants would have to carry him on their shoulders from house to house . Governor Khan was hoping that Siyyid Ja'far would die in prison. One night the governor's wife had a horrible dream about the prisoners that caused her to take pity on them. She asked her husband to release the prisoners. He refused. She developed and executed a plan and helped them to escape. Hájí Muhammad Taqiy eventually left for Baghdad where he met Bahá'u'lláh and then stayed there. Siyyid Ja'far stayed four years in Herat, then returned to the city of Yazd in the year 1857. He has received a very famous tablet from Bahá'u'lláh - “Suriy-i-Nush”, which contained answers to a few questions that he had asked Bahá'u'lláh. Later he went to Baghdad where he met Bahá'u'lláh, and then he died upon his return to Yazd. His children Fatimih Begum, Siyyid Mossa and Siyyid Muhammad played a major role in the Bahá'i Faith at the time. His daughter Fatimih was six years old, when Vahid came to Nayriz. She was an extremely bright young girl who studied Arabic and Persian literature with her father. Before the upheaval began, they had a comfortable life, but then everything was lost and the period of suffering and hardship began. Later, Fatimih married Hájí Muhammad Ismail, a successful merchant in Yazd. When Nayriz was becoming prosperous again she returned with her husband and three of their children. The son of the former Governor Zaynu'l Abidin Khan, Phat-Ali-Khan, was informed of their coming and sent a secret message to the people of Qatruih to kill her husband by poisoning him. Fatimih and her three children, the youngest one being only one year old, were left alone in Qatruih. When the news of what took place got to Nayriz, Mulla Muhammad Shafi sent a few Bahá'ís to rescue her and bring her to Nayriz. She had a productive life of teaching and training the women of town. She died in 1883 and had been the recipient of a wonderful tablet by Bahá'u'lláh. Her third child, Mirzá ‘Abdu'l Husayn, ( Tahereh's grandfather) was only one year old when starvation spread in the town. The situation was so severe that wild animals would come down from the mountains, attacking people, sometimes grabbing children from their beds or the hands of their mothers. It was called the year of the Wolf. During this time a wolf grabbed Mirzá ‘Abdu'l Husayn and ran away with the young boy. Nobody could find him. They believed he was dead. While they were searching for his dead body, suddenly they heard a cry of a baby and they found him alive in a pool of blood. They treated his wounds. He survived the attack, but for the rest of his life he had a big scar on his face. Mirzá ‘Abdu'l Husayn lived to be fifty. He married Nuri Jan, the daughter of Mullá Muhammad Shafi and had five children with her. Muhammad Husayn, surnamed Vafa by Bahá'u'lláh was a prominent figure in Shíráz and Nayríz at the time of Bahá'u'lláh. His father was Mullá Baqir. His mother was the niece of the Imam Jumih of Shíráz. Vafa's grandfather Mullá ‘Abdu'l Samih, nephew of the Imam Jumih of Shiraz, was a well-known scholar. Vafa's daughter, Khavar Sultan, married my great grandfather, Mullá Muhammad Shafi. His father, Mulla Baqir, was respected by Muhammad Sháh, the king of Persia and envied by the jealous Mullás of Shíráz. Vafa was a teacher in the court. A very handsome man, Vafa dressed very colorfully and was a popular poet in Shiraz, especially among the women. Most of his poems were love stories that the ladies of town would often recite in their local dialects. His name, which means “Fidelity”, is in itself a poetic name. In his poetry, he not only spoke of love and affection for Bahá'u'lláh, but also of his ultimate surrender to the faith of Bahá'u'lláh. To avoid any further trouble and problems, his father moved to Nayríz where due to his relationship to the Imam Jumih of Shiraz and his closeness to the king, Nayrizis treated him affectionately and respectfully. Married three times, he met his wife Fatimih while visiting the women's prison in Shiraz with his father. She had lost her first husband and her son in the Nayríz upheaval. As was the custom in those days, Vafa became the custodian of the mosque in Nayríz after the death of his father. Vafa asked Bahá'u'lláh in a letter a series of very important questions about the Worlds of God, the Return, the Ordinances of God and Paradise. Bahá'u'lláh answered his questions in the ‘ Tablet to Vafa'. Later he met Bahá'u'lláh in Baghdad, was confirmed in his faith and became enchanted with Bahá'u'lláh's writings. Vafa who died from a heart attack while still in his thirties, was the recipient of a Tablet of Visitation revealed especially for him from ‘Abdu'l Baha. The beautiful tablet was engraved on Vafa's stone in the public cemetery. Muhammad Husayn, surnamed Vafá by Bahá'u'lláh was a prominent figure in Shíráz and Nayríz at the time of Bahá'u'lláh. Vafá asked Bahá'u'lláh in a letter a series of very important questions about the Worlds of God, the Return, the Ordinances of God and Paradise. Bahá'u'lláh answered his questions in the ‘ Tablet to Vafá'. In addition to being a respected and dedicated Bahá'í, Vafá was recognized as an accomplished poet. The following pages contain a poem in eight parts composed by Vafá. Each poen is presented in the original Farsi with an English prose translation. The original poems can be found in Lama Atul-Anvar (v. 1 p. 241) by Muhammad Shafi Rouhani. Poems are online at nayriz.org/template.php?pageName=vafaWkx0 (click "next" to see all the poems). Mírzá Ibráhím, known as Khoshnevis, for his beautiful handwriting and calligraphy, became a Bábí during Vahid's tenure in Nayriz. He was also a teacher. Mírzá Ibráhím and his wife were known for being advocates of the poor and dislocated in the years after the first upheaval at the Khájih Fortress. His mother-in-law tried on many failed occasions to kill them for becoming Babis by serving them food spiked with poison. Mírzá Ibráhím's greatest contribution to the Cause was the transcription of tablets addressed to the Bahá'ís of Nayriz by Bahá'u'lláh. He made several copies and stored them in various locations for safekeeping. Since the Bahá'ís houses were constantly being raided and their properties destroyed, those tablets would not have survived without his efforts. He was a recipient of many tablets from Bahá'u'lláh and Abdu'l-Bahá and served as a Trustee of the Huquq'u'llah. Copies of tablets and prayers of Bahá'u'lláh and ‘Abdu'l-Bahá in his calligraphy are kept in the Bahá'í Archives, catalogued under Ibráhím's collection including works sent to Haifa recently by Mr. Jalal Misaghi. Hájí Muhammad Taqiy-i-Nayrizi, one of the most beloved and important supporters of Vahid during the first upheaval in Nayriz was very wealthy and had a close relationship with the governor who lived nearby. When Vahid came to Nayriz he stayed in Hájí Muhammad Taqiy's magnificent house in the Bazaar section for a few days. He suffered extensively in the hands of the governor and the enemy after the upheaval was over. Because of all the pain and punishment, Bahá'u'lláh revealed one of his mightiest tablets, known as the “Surih-i-Saber” or “The Tablet of Patience”, or the “Lawh-i-Ayyub” in his honour. Ayyub, like the biblical Job, suffered a great deal. 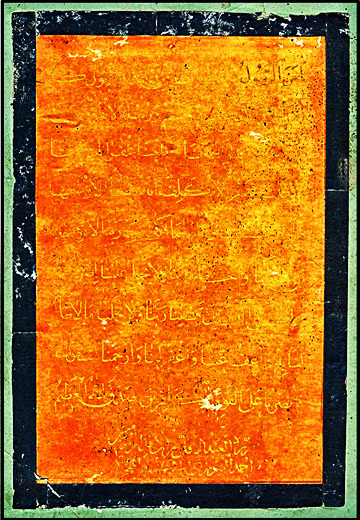 The tablet was revealed the first day of Ridzvan, when Bahá'u'lláh was in the Garden of Najib Pasha. In the tablet, He also mentions Vahid with admiration for his station and services. Ayyub was put in prison after the upheaval with another distinguished Bábí – Siyyid Ja'far-i-Yazdi. Altogether there were fifteen of them as prisoners. It was during this period that their suffering really began. According to Governor Zaynu'l-Ábidín, Hájí Muhammad Taqiy's money paid for all the expenses of the first upheaval. He was so prominent in the commercial life of Nayriz, that his signature on a paper meant it could be traded as paper money in exchange for goods and services. After he was arrested, the governor took the title of all of Taqiy's land, homes and belongings for himself. Hájí Muhammad Taqi was put in a prison, which consisted of a few very small, dark and humid rooms. Every day one of the prisoners was carried out of the prison and thrown in the little pool in the governor's house. It happened that often he would be the one selected for the punishment. Each time he would raise his head out of the water to breath, the attendants and the servants of the governor hit him. The governor inquired, “Why is it that every day you are the one that comes out?” Hájí Muhammad Taqi replied, “We have some kind of lottery among the prisoners and whoever loses is the one that comes out. ” Then he added, “It is just my luck that I am the one who always ends up being the looser and I have to get this punishment”. In truth, he was volunteering every day to come out during that winter. He suffered a great deal in the hands of the governor. By the time they finished torturing him the water would turn red. Soon his head was swollen and his eyes were damaged permanently. The servants would take him out of the pool and carry him around town to the houses of wealthy Nayrizis to collect money in his name. The distinguished historian, Taher Malmiry has written that one night the governor's wife had a dream: a few women dressed in a black robes were crying, saying: “ Pity on the governor. Who is doing all those harmful things to the descendant of the Prophet Mohammad?” She woke up her husband trying to convince him that he should release the prisoner. The governor refused and said that it was a false dream. But she did not give up. The next morning she contacted a friend of hers: the leader of Sadat, another section of Nayriz. She asked him to have five donkeys ready at night outside the gate of the town. Then she sent a message to the family of Siyyid Ja'far-i-Nayrizi and Hájí Muhammad Taqiy to come and meet their husbands outside the city gate. She sent two of her attendants to the prison to bring Siyyid Ja'far-i-Nayrizi and Hájí Muhammad Taqiy to a secret meeting place. She advised them to move quickly to the town of Herat, near Yazd, since it was not under the jurisdiction of the Governor Zaynu'l-Ábidín. They travelled thirty miles distance at night with the governor's attendants and soldiers following them. They received extensive medical help and stayed in Herat for a few months. Siyyid Ja'far became the religious leader of Herat and stayed there for an additional five years, but Hájí Muhammad Taqiy went on to Baghdad to visit Bahá'u'lláh. Throughout those miserable ninth months he had been always grateful for recognizing the Báb and having become one of His followers. He left Yazd accompanied by his wife and two children, a daughter, Gohare and a son, Mohammad Ali. In Baghdad, Hájí Muhammad Taqiy met Bahá'u'lláh and recognized His station. Bahá'u'lláh, having realized the extent of his suffering, asked him to stay in Baghdad as one of His companions. Hájí Muhammad Taqiy spent three years in Baghdad before he died there. It is significant that Bahá'u'lláh attended his funeral. Many others also attended. He was buried in the public cemetery of Baghdad. Unfortunately not long before his death, his son Muhammad Ali was shot and killed by an unknown assailant in the forest outside Baghdad. When they brought his son's lifeless body to Hájí Muhammad Taqiy, he raised his hands and announced that he has had only one worldly attachment and God has taken even that from him. Finally, he was completely free. Bahá'u'lláh after hearing this mentioned that Taqiy's suffering and patience had surpassed the “patience of Job” since Job had often complained about his pain and difficulties, but Hájí Muhammad Taqiy had always been thankful in adversity. Gohar and her mother returned to Nayriz, where the daughter married. Bahá'u'lláh realizing the pain of the widow of Taqi, asked Gohar to adopt another boy and to raise him like her son. This boy's name was also Muhammad Ali. My dear Aunt Eshraghieh was an example of a modern living martyr. From her early days in school in the Muslim section of Nayriz she was constantly the subject of abuse, insults, and stoning by other children and adults on her way to and from school. They threw her books away, stole her lunch and cursed her to her face. She was a shy and sensitive girl and the insults to her beliefs and the central figure of her faith was unbearable. She was under so much pressure, from the torments and the cruelty, that she could not continue her education nor participate in the final exam. Eventually, along with some other members of the family, she left Nayriz. She lived in the city of Abadan for a few years. Unfortunately she accepted a marriage proposal from a distant non-Bahá'í relative and returned to Nayriz. Once again she fell into to the depth of misery, this time more severe than before. While in Nayriz, Siyyid Moheydin was the mullá in charge of the mosque in the Mahaleh of the Chinár-Sukhtih district. He caused tremendous and horrible pressure on Bahá'ís for more than thirty years. Due to his actions, great numbers of Bahá'ís decided to leave Nayriz and take refuge in other parts of the country. During this time, on numerous occasions her relatives assaulted her. They tried to force her to the mosque to recant, but she refused. In return she tried to show more love for them. For fifteen years on a daily basis she washed their clothes, fed their children, took care of their animals, walked miles and miles to bring fresh water, and cleaned their houses, but they never showed any appreciation or kindness towards Eshraghieh. They continued to tell her that since she was a Bahá'í, other people were not dealing with them because she was considered unclean. They prevented her from praying and fasting and they stopped her from having any communication with other Bahá'ís. She contracted tuberculosis and developed an ulcer. Mistreated and denied medical help, no one came to rescue her or help. At the end of her life they sent her to her older sister in Shiraz and it was there she died while only forty years old. She was buried in the Bahá'í cemetery in Shiraz. I remember my Aunt Eshraghieh very well. She was extremely kind to me. I often recall the memory of her gentle face, her soft look and voice. Muhammad Ibráhím Amir, known for his bravery and good looks, showed great courage as one of the defenders of the Khájih Fort in support of Vahid. After the first upheaval he managed to escape. During the second upheaval he and his brothers joined Sardar's forces positioned on the Balataram Mountains, south of Nayriz. He received the surname Amir, meaning Commander, from Bahá'u'lláh. The governor had been quite anxious to capture them since they were the ones who during an earlier incident captured the two sons of the governor's brother. They had brought the boys as prisoners to Vahid in the Khájih Fort. Vahid forgiving the captives released them to return to the governor with a message. As soon as gates of the fort opened, the enemies thinking the two were Bábís, fired fatal shots at them. After the second upheaval Amir and his brothers were captured but managed to get away in a daring escape. The soldiers tied their hands behind them and were carrying them to the governor's mansion. Somehow Amir managed to untie his hands, grab a knife from one of the guards, fight the guards, untie his brothers and rescue them. Once again, they all managed to escape and take cover in the mountains. Amir travelled to Baghdad and became a follower of Bahá'u'lláh. He stayed with Bahá'u'lláh for the rest of his life. Abdu'l-Bahá gives tribute to him in the book “Memorials of the Faithful”. Mr. Ali Nakhjavani is his great grandson, through Amir's daughter, Bahiyyih. Mullá ‘Alí Naqí was the son of Mullá ‘Abdu'l Husayn, the elderly man who greeted Vahid and who later gave his life for the Bábí Faith. Mullá ‘Alí Naqí was the father of Mullá Shafi, the distinguished historian, whose diary we referenced extensively for the book. He is one of my ancestors. There is not much information about Mullá ‘Alí Naqí. We do know that he was a Mullá, a scholar and that he valiantly served the cause along with his father, brothers and uncles in the first and second Nayriz upheavals. According to Faizi, Mullá ‘Alí Naqí participated in the second mountain upheaval with Sardar, as his principal assistant. According to the historian Fazel Mazandarani, Mullá ‘Alí Naqí showed great courage in battle. On one occasion, Mullá ‘Alí Naqí said that he would take part in just one more attack that day, even though he was tired and weak. While he was screaming “Yá Sáhibu'z-Zamán!” (Lord of the Age) and attacking the enemy, he took a bullet to the head and was killed that day. Mirzá Ali, known as Sardar, “Chief Officer ” was the leader of the second Nayriz upheaval. He belonged to two distinguished families living in the Chinár-Sukhtih district of Nayriz: the Dah-Bradaran and Zarmaqali families. He never married. My grandmother is the granddaughter of Sardar's sister. He was a favourite and loyal follower of the Báb. Young, brave and extremely clever, when the first Khájih Fortress battle was over, he escaped with a few other Bábís. Living outside the city limits, he stayed in the mountains or in the surrounding orchards. A very cautious man, well known to the governor and others who were suspicious of him, he refused to return to Nayriz during daylight. Clothed in the darkness of night, he would frequently enter the town. The governor was aware of his coming and going, and although there wasn't much the governor could do about it, he was constantly planning to capture the illusive Sardar. Eventually he was caught. There was a rebellion in the town of Qatriuh, not far from Nayriz, owned by the governor, as Lord of the Village. The villagers refused to make tax payments. The Governor told Sardar, that he would be released, if he would quell the rebellion. Sardar accepted the assignment in defence of his life. Before leaving for Qatriuh, the governor gave him a horse and a sword as gifts. Sardar collected some of his friends: mostly Bábís. As they approached the village, which had a fortress, he sent a message to the leader of the small rebel group, told him he was there to carryout the order of the governor and that he was there not to harm them but to bring order and to collect the taxes. The villagers refused to open the gates and let Sardar or his companions inside the fortress. One night Sardar took advantage of the darkness. He and his friends climbed over the fortress wall. They put a few of the village leaders under arrest. The villagers had no choice but to cooperate. Sardar promised that the governor would treat them justly. After he brought about some order to the village, he released the former agents of the governor who had been imprisoned by the villagers and returned administrative authority to them. Even though there was a message from the governor that he was anxious for Sardar to return to Nayriz to receive his reward, Sardar refused to do so. He sent a message to the governor saying that the best thing for them would be to stay away from each other: that he should live his life and Sardar would live his. He returned to the safety of the mountain, where he devoted his time to caring for the Babis and those who were in need. Sardar's relationship with the governor further deteriorated for good reason. Sardar believed in the coming of Qa'im, he accepted the Cause of the Bab, which was contrary to the governor's beliefs. Sardar loved and supported Vahid, during the first Khájih Fortress battle. Remembering what they did to him left a scar in his heart. The governor arrested and harassed the Bábí leader even after the incident was over. The governor had killed his own brother when he claimed the governorship. The children of the dead brother were taking advantage of this friction between Sardar and the governor, encouraging the Sardar to lead a battle against the governor. Sardar, after leaving Qatriuh, collected all the materials, food supplies and clothing that he needed, and then took refuge in the mountains. Other Babis gradually realizing that their lives were also threatened joined him and that was the start of the Second Upheaval. Sardar had a very close friend, Hasan Mírzá, who was like a brother to him. Throughout Sardar's life Hasan was by his side. By the time Sardar accepted the cause of the Báb, Hasan also became a believer and later on gave his life for his beliefs. The event that made the two of them very popular in the Nayriz area occurred when they fought some 70 tribesmen in the village of Rustaq, one of the towns he administered for Governor Zaynu'l-Ábidín Khán. They easily captured the thieves and handcuffed them. However, before they could bring the captives to the governor's house for punishment, the delinquents begged Sardar and Hasan for forgiveness. So, they let them go. Behaviours like this added to their popularity with the villagers too. He was killed before the end of the Second Upheaval. Khavar Sultan was the daughter of Fatimih and Shaykh Muhammad Husayn Vafa. During the second upheaval, which took place on the mountains south of Nayriz, Fatimih fought along with her husband. After the war, they beheaded her husband. The soldiers carried his head aloft a spear, while she was one of the prisoners who followed on foot all the way to Shiraz. Fatimih's son died on the way to Shiraz from the lack of food. It was in Shiraz that she met and married Shaykh Muhammad Husayn, surnamed Vafa. Khavar Sultan was also grandniece of the Imam Jumih of Shiraz, the leading mullá of the town, who on a number of occasions had saved the life of the Bab. Khavar Sultan married Mullá Muhammad Shafi after his first wife died. She moved to Nayriz where she became quite a capable and leading figure like her father Vafa. She was a role model for all the women of Nayriz. She used her ability to read, write, and lecture and helped the Babi and Bahá'í women in town. She was a teacher in the Bahá'í schools. Often at weddings she was the adviser to the family and at memorials she was the one to provide comfort to others. During the Third Upheaval, Khavar Sultan, along with other women and children went into hiding in the mountains. She had to say goodbye to her son, Shaykh Muhammad Husayn and the other men who had escaped. For two months she and other family members were able to hide in the homes of non-Bahá'í relatives. Khavar Sultan raised five wonderful children. She had been the recipient of many tablets from both Bahá'u'lláh and ‘Abdu'l-Bahá. Most of the tablets were revealed following the Third Upheaval, however they were lost in the major flooding that destroyed parts of Nayriz. She died at age 68. Son of Mírzá Ibráhím Khoshnevis, Mírzá Aqha, was my great grandfather on my father's side. Like his father, he had very good handwriting and transcribed the holy book, the Kitáb-i-Aqdas and the Kitáb-i-Íqán, which were distributed throughout Iran. Mírzá Agha married, Fatimih, niece of the celebrated Sardar, leader of the second Nayríz upheaval fought primarily on the mountain. As life in Nayriz became unbearable for him, due to persecutions, he moved to Isfahan and then to Tihrán where he married and established three distinguished Bahá'í families: Sadeghpoor, Sadegheyan and Fadai whose descendants are my second cousins. Mírzá Agha's daughter from his wife in Nayriz, Saheb Jan married Shaykh Muhammad Husayn (my grandfather) who was the son of Mullá Muhammad Shafi, the eminent historian.